According to research by Fact.MR, consumption of avocado extracts is estimated to surpass 211 thousand tonnes in 2019. The study finds that demand for avocado is rising rapidly wherein volume consumption grew at nearly 8% in 2018. 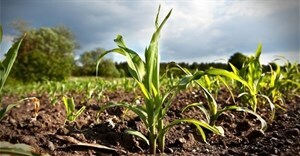 "The avocado extract market closely follows avocado supply chain. Low farm prices, as well as logistics and operational challenges associated with avocado, continue to add volatility in the market. However, efforts to increase production capacities have strengthened the supply chain which is meeting the surging demand for avocado. Amid this scenario, the avocado market generated worth $1.3bn in revenues in 2018," says Sneha Varghese, a senior research analyst at Fact.MR. The study opines that among different avocado extract products, avocado oil is highly consumed. Along with the health benefits, growing demand for edible oils and application in food and beverage and cosmetics industries are few of the important fillips responsible for the rising consumption of avocado oil. In addition, rising consumption of packaged and processed foods also contributes to the rising demand for avocado oil which is one of the most widely used ingredients in processed food and beverage products. The growing appetite for avocado has increased the number of avocado recipes in restaurant menus. In particular, demand for guacamole has surged considerably which, in turn, has increased utilization of avocado puree in commercial and home-based applications. Application of avocado extracts remains heavily consolidated in the food and beverage industry. The study estimates that nearly 35% of the avocado extract application in 2019 will be in the food and beverage industry. Rising consumer preference for natural ingredients in food products and clean label trend are fuelling the utilisation of avocado extracts in the food industry. According to the study, consumption of avocado extracts in the pharmaceutical industry is growing at a healthy rate. Avocado extract consumption in the pharmaceutical industry is estimated to grow at 7.1% year-on-year in 2019. Dissemination of knowledge regarding healthfulness of avocado and beneficial results in disease management present a growing potential for avocado application in the pharmaceutical industry. Cosmetics and dietary supplements are other lucrative avenues for the avocado extracts market, as demand is estimated to rise steadily in the coming years. Avocado oil application in the cosmetics industry is traditional, however, consumer preference for avocado ingredients in natural beauty products is rising. The study finds that over 55% of the global avocado extract consumed are of hass avocado origin. 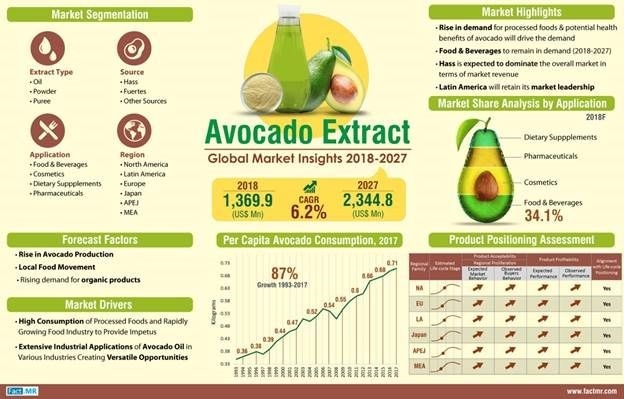 However, increasing demand for locally produced avocado extract products is likely to witness the growing demand for other sources of avocado extracts over traditional sources. The study also opines that Latin America will continue to hold its pole position in the avocado extract market. 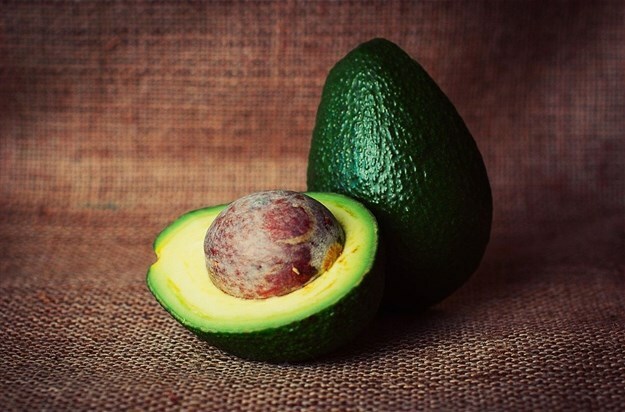 While hosting the largest avocado producing countries including Mexico, Peru, Columbia, the Dominical Republic, Argentina, Chile and Brazil, one-third of the global consumption was held by Latin America in 2018. North America follows Latin America in avocado extract consumption wherein market remains import-oriented with significant import from Mexico.